This is the second post in an 8-part series on how to rank your business for local searches at Google. Google My Business (GMB) is a free product that allows business owners to verify and submit basic details about their business to Google. Owners can also engage with existing and potential customers across Google’s properties. After starting its life as a rudimentary web form called the Local Business Center, Google My Business has matured into a highly sophisticated product over the last decade. In the last couple of years, GMB received many improvements. GMB is an essential part of a well-thought-out local SEO strategy. 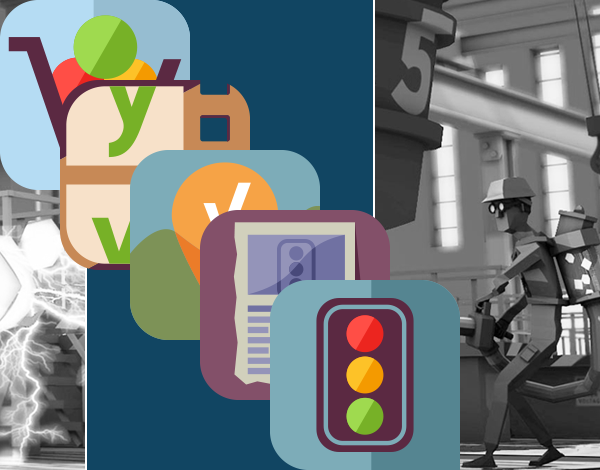 GMB offers highly-rated companion apps on both the App Store and Google Play. It also provides metrics about the visibility and engagement with your business that no other product does (including Google Analytics). Any business with a bonafide brick-and-mortar location is eligible for a Google My Business listing at that location. For businesses with two or more locations, each location would be eligible for a distinct GMB listing. Well, if you don’t operate a walk-up brick-and-mortar location, but visit your customers in a particular geographic area, you’re what’s called a “Service Area Business.” Examples of Service Area Businesses are plumbers, carpet cleaners, and courier services. In this case, you’re still eligible for a listing. However, you’ll want to choose “Yes” when Google asks if you deliver goods and services to customers at their location. Just because you serve customers in a given market does not mean you’re eligible for a Google My Business listing in that market. For example, an eCommerce company based in Chicago would not be eligible for a GMB listing in Dallas just because they had customers in Dallas. Google tries to make sure that only legitimate businesses are represented in GMB. It requires anyone who attempts to claim a Listing verify their association with the business in some way. 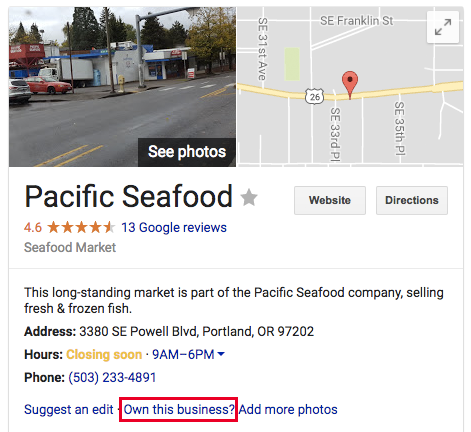 The easiest way to start the process is to perform a desktop search at Google for your business name (for example, “Pacific Seafood Portland”). In the panel on the right-hand side of the page, you’ll see a link that poses the question “Own this business?” Importantly–before you click that link to begin the verification process–make sure you are either not signed in to Google (you can create an account in the next step), or are signed into a Google account for your business as opposed to your personal Gmail. It’s not a GMB requirement, though; however, it’ll be much easier to share access to your listing with employees or other agents of your company from a business account. 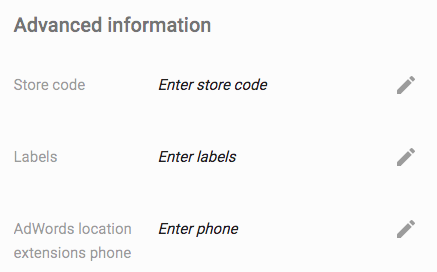 Once you fill out the most basic information (see below for what these details are), if it can corroborate your address and phone number, Google will call and ask you to enter a PIN number on screen. If it hasn’t previously seen a business with the phone number and address you submitted, you’ll be mailed a postcard within a week with instructions for how to PIN verify. This sounds simple, but it’s surprising how many business owners overthink these core attributes or try to “optimize” them. Your Name, Address, and Phone (NAP) are your basic thumbprint online. If they don’t reflect your business accurately at Google My Business, Google (and your customers) lose trust that you are who you say you are. They will stop sending business your way. Do NOT stuff keywords in your business name. Represent yourself as you would answer the phone or welcome a customer into your store. You probably see spammers doing this and succeeding all the time, but at some point, it’ll come back to bite them. Google is monitoring for these kinds of abuses all the time and getting better at blacklisting the abusers. Submit the same address you use on your website. (If you’re a Yoast user, this should be the address you enter in the Yoast Local SEO plugin.) Even if you’re a service-area business, you’ll have to submit a physical address and not a PO box or other mailing-only address. You’ll see a map displayed just alongside your address. Zoom in and double-check that the pin is in the correct place on your business. Google’s pin precision for U.S. addresses is typically pretty good, but it can be spotty in other countries. Don’t use a tracking phone number to segment customers coming from Google vs. other sources. There are ways to do this, but they’re pretty advanced. Implementing tracking numbers incorrectly can do tremendous damage to your local search rankings. From a rankings standpoint, the category field is the most important attribute you can optimize at Google My Business. In my experience, it’s best not to listen to Google’s advice on categories on this one, particularly since that advice has changed so frequently over the years. Google maintains a taxonomy of several thousand categories to describe local businesses. By typing in a few characters of a keyword that describes your business, you’ll probably find a match pretty closely. 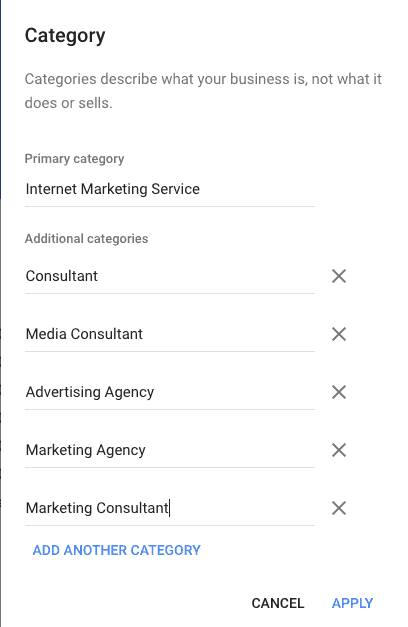 Google suggests “using as few categories as possible,” as well as categories that are “as specific as possible.” And while it’s true that Google can and does “detect category information from your website and from mentions about your business throughout the web,” my advice is to explicitly specify as many relevant categories as you can on your Google My Business listing. If you operate a small restaurant that’s open from 7 am – 3 pm, select “Breakfast Restaurant,” “Brunch Restaurant,” “Lunch Restaurant,” “Restaurant,” “Cafe,” “Coffee Shop,” and any other relevant category. Take the time to enter multiple keywords that describe your business and see which categories match. Use all of them that are relevant. Google’s automated review system may remove one or two from your listing, but this is not spam–provided you select relevant categories–. It helps you show up for as broad a range of searches as possible. Google calls this field “website,” but it doesn’t have to be your “website” per se. In particular, if you operate more than one location, you may want to enter the page on your website that corresponds to the location you’re submitting to Google (rather than your homepage). Opinions are mixed as to whether listing your homepage or a location page will help you rank better, so do what’s best for prospective customers. If you think your homepage will give them the best initial sense of your business, then submit that as your “website.” If a location page (or even some other page) will give them a better sense, submit that instead. After entering the attributes above, you’re asked to verify your listing. But don’t stop there. There are a few other attributes that are well worth your time to add. Photos may be the most neglected attribute in all of local search. The success of Instagram, Pinterest, and any number of lesser-known apps indicates just how visual our internet culture has become. Consumers often select (or reject) a business because of its photos. Not only on the content of the photos but their quality and professionalism. Photos are especially important in the mobile ecosystem that Google My Business powers (including Google Maps), where they are the dominant representation of a business in Google’s card-focused user interface. As with all local media or social media sites, Google My Business has its own image format requirements. Take some time to review them and make sure you have high-quality assets for each format. Optimizing your photos also offers a great opportunity to engage your customers. At the very least place the ones you’re considering at your point of sale and ask them to choose which one they like better. Or get even more creative and start a contest among your customers to show your business in its best light, with the winner–as voted on by other customers–receiving a cash prize or gift card. Selecting your opening hours is pretty straightforward. Google has dramatically improved its interface for telling customers when you’re open over the past several years. Hours will be front-and-center wherever customers interact with your business on Google so they should definitely be accurate. You can now even daypart multiple times during the day, and add specific hours for holidays and special events. While you can’t control it, you may be interested to know that Google now displays the busy-ness of your business in real-time. This is based on aggregate location-tracking of visitors with Android phones and iOS Google Maps users with location services enabled. Certain categories of businesses will have the option to add a link to a menu. If you’re lucky enough to be in one of these categories, I highly recommend adding this link, as it gives Google an additional set of keywords that your business for which should be considered relevant. These are low priority fields. All three are geared primarily towards large multi-location businesses and franchises. Two significant ranking factors over which you have little control have to do with the physical location of your business. The first is the proximity of your business to the location where your prospective customer is performing her search. All other things being equal, Google will choose to display a business closer to the searcher than one farther away from her. In the early years of Google, its algorithm favored businesses which were close to the center of a given city or its “centroid.” Google simply wasn’t as good at detecting the location of the searcher. It defaulted to showing businesses in the areas of highest population density. This factor has declined in importance, especially for mobile searches where Google has a precise idea of where you are. Google has also gotten better and better at detecting the location information of desktop searchers, partially through surreptitious means of collection. The second factor is having an address in the city in which your customer is searching. If your customer is searching in Seattle, your Tacoma or Bellevue-based coffee shop won’t appear, simply because it’s not relevant for that search. Short of opening additional locations to target areas where high concentrations of your customers are searching, there’s not much you can do to optimize for these ranking factors, but you should be aware of their importance. Google provides a free, lightweight analytics package as part of GMB. This gives you a basic sense of how customers and potential customers are viewing and interacting with your listing. Insights shows how many times your listing appears in plain old search vs. Google Maps. It also shows the number of clicks to your website, requests for driving directions, and phone calls. There’s also a simple breakdown of how many customers see your listing for direct searches (for your business specifically) vs. discovery searches (for businesses in your category). While no one outside of Google is entirely sure how they calculate the discovery number, it’s probably as good a barometer for the overall strength of your local SEO as any, particularly if you track it over time. Unfortunately, this is harder than it should be, as GMB Insights are only visible as snapshots-in-time. Unless you remember to check them regularly and transfer them to a spreadsheet along with the date, it can be difficult to track your growth. Strangely, there’s no default longitudinal view built into the product. The most common GMB troubleshooting issue continues to be the existence of duplicate listings for the same business. While it’s gotten harder to detect duplicate listings, it’s much easier to close them. I’ll cover why duplicate listings are bad for your business in future installments of this series. The first step to identifying duplicates is to search for your business name on maps.google.com. You’ll see a little more comprehensive list of potentially-matching results than Google is willing to present on Google.com. If it looks like multiple listings refer to your business, select the one you’d like to report as a duplicate and click “Suggest an Edit.” On the following screen, slide the “Place is permanently closed or never existed” bar to “Yes,” and select the radio button next to duplicate. Google support staff are generally responsive to these kinds of reports within a week. If you continue to have trouble, ask multiple people–co-workers, friends, family members, or relatives–to report the same problem, and it’s more likely Google will look at it. If your issue seems particularly thorny, you’re most likely to get a response by tweeting @googlemybiz, the official Twitter support channel for GMB. And if Google support just isn’t cutting it, Joy Hawkins, who just started her own company last year after years as the GMB expert at a large agency, is an invaluable resource for troubleshooting additional issues. At various times in its past, Google My Business has seemed like the hot potato no one wanted to wind up holding at Google Headquarters. That no longer seems to be the case. GMB has become Google’s front-line defense against Facebook’s overwhelming mindshare among small business owners. The main product has become much more robust. Google has released two major sub-products within GMB–Messaging and Posts–just within the last couple of months. The goal of both products seems to be to get small business owners to engage with their customers via GMB on a regular basis, as opposed to a “set it and forget it” basis. We’re also starting to see a handful of third-party integrations that allow customers to book appointments or order products directly from the Google search result for select businesses. While it’s too early to tell whether usage of any of these new features might benefit your rankings, it’s something that experts in the local search community will be following closely in the coming months. Represent your Name, Address, and Phone exactly as they appear to customers in the real world. These are not attributes to optimize. Pay special attention to categories and select as many categories as are relevant for your business. Upload great photos of your business, and if you don’t have any, consider hiring a professional photographer to do so. Take advantage of the relatively new option to add a menu URL if you’re in a relevant business category. Consider using the Discovery metric from GMB Insights as a barometer for the overall strength of your local SEO. Pay attention to new engagement features from Google as they’re released.